Welcome to Central Child Care! Central Child Care, a licensed non-profit child care and day care center, has provided a loving, safe environment for kids since 1958. This long standing commitment to the welfare of young children has led us to be one of the top Evansville child care facilities. We believe that when a child is born, their world is full of possibilities. Possibilities of discovering, caring and sharing, adventure and success, and the fullness of God’s Love. At Central Child Care we strive to help each child achieve these possibilities. Our staff is throughly committed to quality child care, and is continually pursuing higher education and training in order to provide the best possible developmental opportunities for the children in their care. In addition to giving the best possible care for children while they are separated from their parents, we administer support and upon request guidance to parents of young children. With strong working relationships among businesses within the community, other local child care agencies, and area colleges we have grown into a high quality child care facility, meeting and exceeding all child care standards in the state of Indiana. 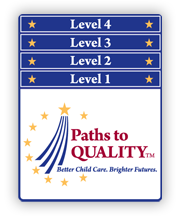 Paths to Quality Level 4 is the highest indicator of quality with national accreditation.Level 4 participants demonstrate the knowledge and skill to plan appropriate activities and opportunities for children that lead to school readiness. Level 4 participants use child observations, assessments, and portfolios to design activities which are inviting, engaging, and challenging to all children in their care. Level 4 programs have made a significant investment in the professional development of the staff and lead caregiver, and incorporate family and staff input into the program. At Central, we make a promise to uphold the highest standards for early childhood development and to excel in our commitment to the families we serve.